Why is it that on those Saturday mornings when you have other things planned (such as the all-important visit to your hair stylist) there are always lots of yard sales? Such was the case on this weekend. Since I finished up earlier than expected at the stylist’s, the YSCE and I had some time to search out a few yard sales. Our first stop was in our own neighborhood. Not a sale I would normally stop at due to the prevalence of toys, but in doing my part in the ‘search for the elusive red airplane’ for Paulette’s grandson, I stopped. No airplane, but lots of other toys and most in pairs. I think they must have twins. Our next stop was also in our town. I had noticed the sign being set up earlier in the week. The seller used an old step ladder on which to attach her yard sale sign. I thought that was a great idea (if someone doesn’t steal your ladder). By the time we got there, the seller was packing up. She allowed me to dig in the box she had already packed up. What fun! I found some treasures! These are glass flower frogs. 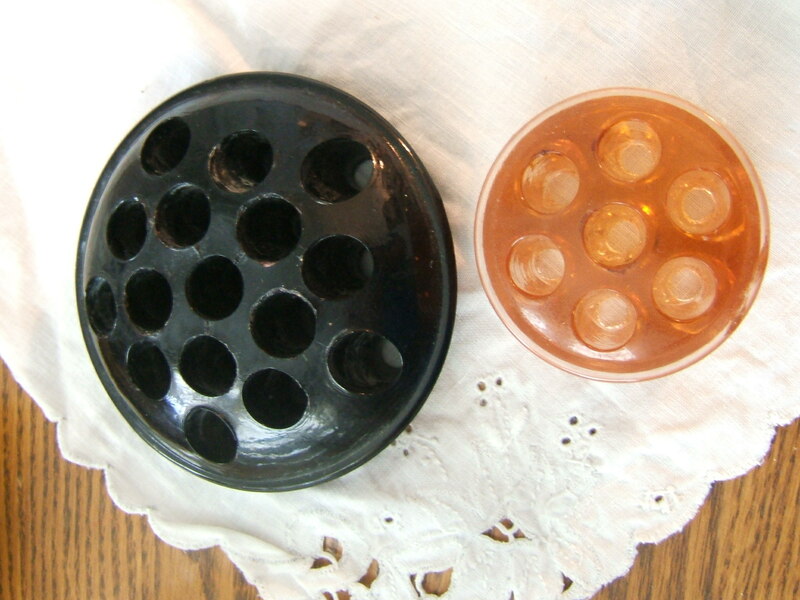 The seller indicated they were old. They are certainly heavy. 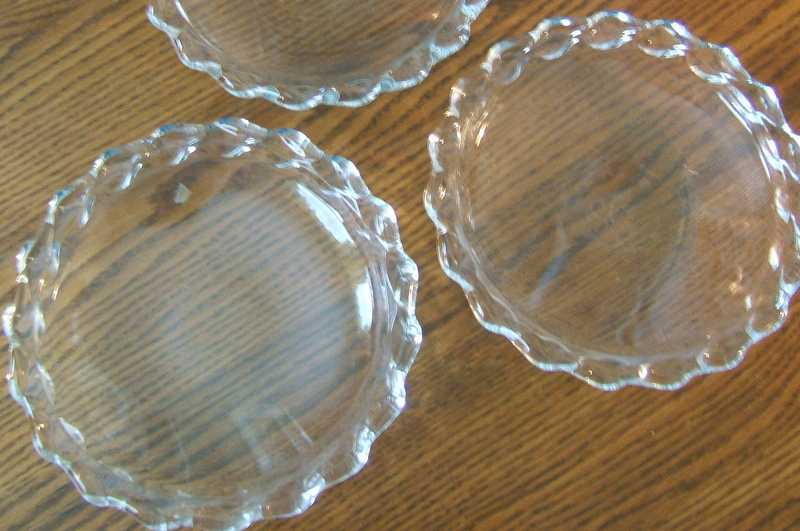 Also in the box were three heavy, clear glass concave dishes. I don’t know if these are salad plates. They have a nice edge to them. Does anyone recognize the maker or pattern? We headed into the neighboring town to see if any of the yard sales were still open. We followed driving directions to a sale that had been advertised as having collectibles, toys, antiques and more. In a box of mostly contemporary hardback books I found Richard Scarry’s Favorite Mother Goose Nursery Rhymes. I just love Richard Scarry’s illustrations. While I did not see Lowly Worm in this book, I did enjoy the illustrations all the same. I also snatched up the vintage Big Golden Book of Three Bedtime Stories from the same box. It is separated from its binding, but otherwise in great shape. These books were the delight of my day. 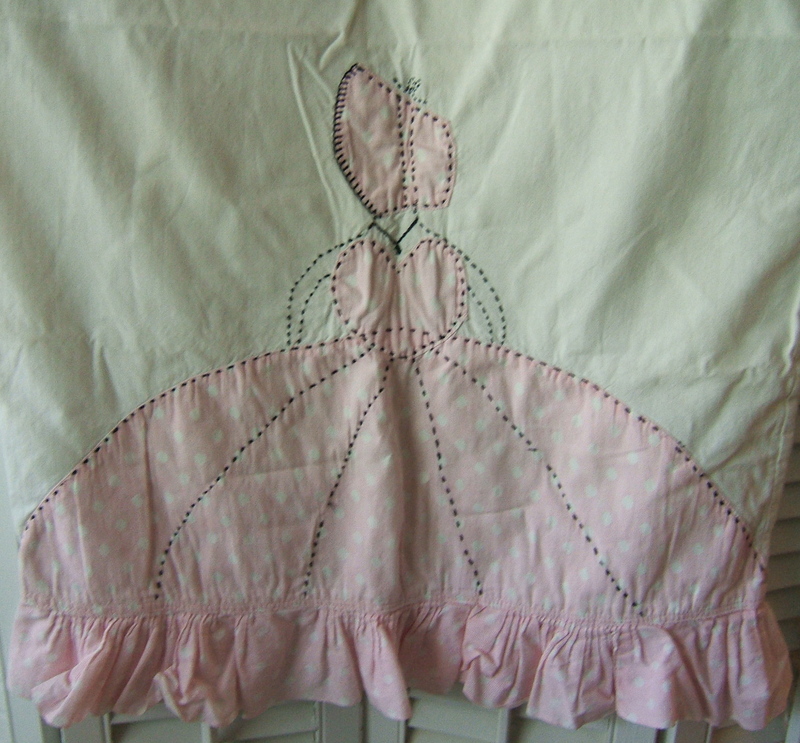 and the Pink Bonneted Belle. Looks like they both need to schedule a date with the iron. 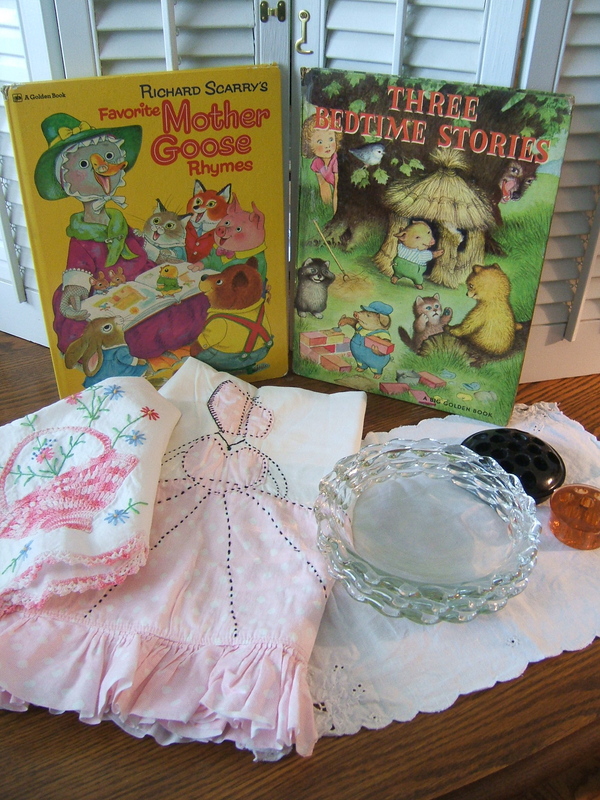 I was very pleased with the items I found in the short time we had available today, including Mother Goose and the frogs. Next week I don’t have any Saturday morning appointments. I wonder if there will many yard sales? 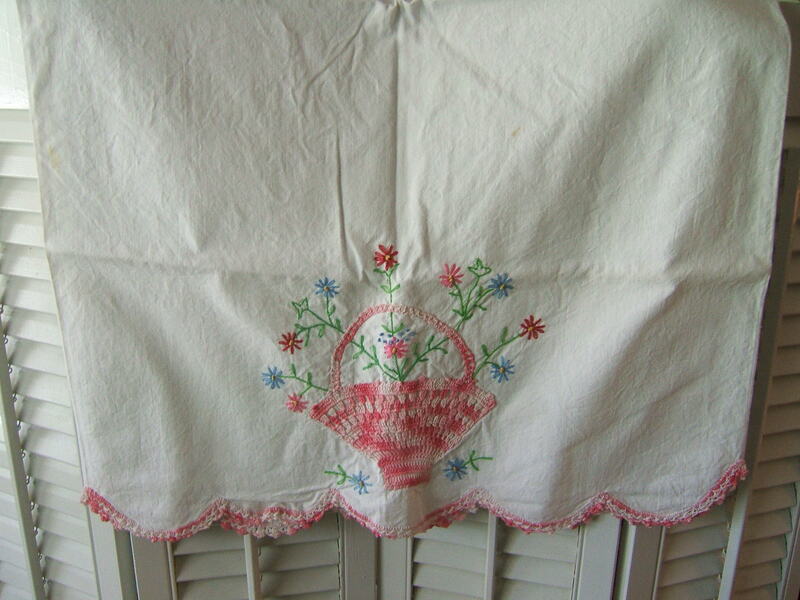 This entry was posted in Cut glass, Dishes, Garage Sales, Linens, Thrifting, Uncategorized, Vintage, Yard Sales and tagged Big Golden Book, Embroidery, Flower Frogs, Richard Scarry, Vintage Pillowcases. Bookmark the permalink. That little red airplane is driving us both mad, but someday you or I will find it. The glass frogs always catch my eye, but I never purchase them because I’m not much of a flower arranger. I can imagine that you will make a fabulous arrangement for one of your glorious tablescape. Fancy pillow slips are one of my favorite things, but I love, love, love your vintage children’s books. I think that the colors are brighter, and the illustrations adorable. They started this morning to demolish my kitchen, what a mess!